The next time you travel to a particularly dry part of the world, you'll wish you could bring along this tiny plastic Fogring donut to ensure your sinuses aren't destroyed while you're supposed to be relaxing. 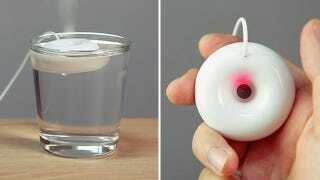 It floats on water and uses ultrasonic vibrations to turn liquids into refreshing vapors—humidifying a room with nothing but a full drinking glass and a USB connection. The ultrasonic transducer technology it uses isn't new, but its extremely compact form factor is. The Fogring's even small enough to be used on an plane, if you think personal comfort far outweighs the panic as other passengers see a cloud of mist rising from your seat. There's no pricing or availability details yet, but it's currently being exhibited at a design show in Paris so the odds are good that this will eventually make its way into consumer's hands.